When you think of cashmere, the memory of that sweater that your sister borrowed and never returned might come to mind. It was soft and light weight but strong and comfy. 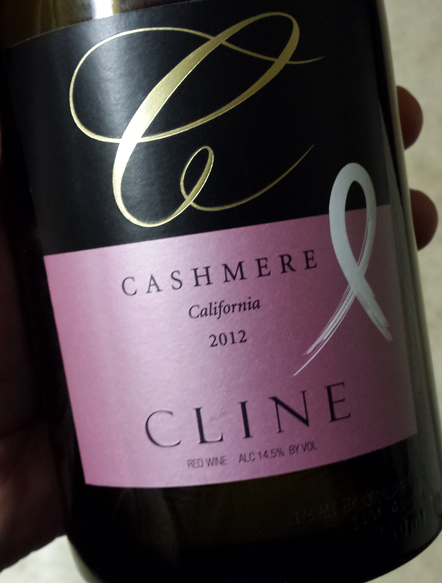 Well, you could easily use those same adjectives to describe Cline’s Cashmere Red. Sometimes when I’m watching a movie, I see someone pour a glass of wine and I think to myself, “That looks like a great idea!” So, I pause the show and go grab a bottle of wine out of the cabinet. I have a wide range of wines in the lock up, from the C.A.T. (Cheap And Tasty) wines to midrange to special occasion wines. Since it was a Saturday night and I hadn’t had any wine all week, I decided to go midrange which, to me is between $15 and $30. Cashmere Red clocks in at around $18 depending on your wine shop. Cashmere Red is a GSM or Grenache, Syrah, Mourvedre blend. Technically, it’s really an MSG wine but that sounds more like that gross flavor enhancer than a tasty wine. This blend is of wine is a little over half Mourvedre and close to equal parts of Syrah and Grenache. This has been a successful blend for quite a few wineries including some of the houses that make Chateauneuf du Pape. It works well because it combines the dark berry and plum flavors and higher tannins of Mourvedre, the bright red berry and lower tannins of Grenache, and the Syrah adds all the complex flavors like all-spice, clove, chocolate and mint to name a few. Combined in the right amounts, these wines can be truly satisfying for even hard to please wine lovers. Cashmere Red is all of the above descriptors, soft, comfortable, rich fruit, mid-tannin, complex and yet easy to drink, and not super expensive. Even though I was just sitting on my sofa watching a super hero film and not drinking it with food, I know this wine can pair well with steaks, chops, grilled winter veggies, or chocolate cake…or all of those together. Well, I need to go plan my next dinner with steaks, squash, chocolate cake and Cashmere. It’s gonna be good!